Telomeres are the protective caps which cover the DNA at the ends of the chromosomes in each cell. If we compare a human chromosome to a shoelace then the telomeres would be the plastic ends of the shoelace. They protect the chromosome against fraying. With each cell division, the telomeres get shorter. When the telomeres disappears, cell division stops and the cell dies off. What is meant by the activation of telomerase? Telomerase is a naturally occurring enzyme that lengthens the telomeres at the ends of the chromosomes. Telomerase is in all cells of the human body – present, but not active. The controlled activation of telomerase increases the telomere length. As a result, the lifespan and the functional capacities of the cells may be extended. T.A. Sciences have strict scientific procedures that ensure the safety and efficacy of the products. Further studies are ongoing. There are no side effects reported from those who took TA-65 capsules. How does the science react? Because of the fundamental importance of telomerase and the substantial amount of data gained in the field since 1995, a completely new branch of biology has risen: the telomere biology. Worldwide, there are already prominent biologists who further research and develop in the field of the telomerase and the effect of TA-65 on the telomeres. How is the quality of TA-65 ensured? This is done by a series of analytical tests. It starts with the harvest of the Astragalus plant. The material is refined in a special process, and the active substance is extracted. The substance ends up in an FDA certified laboratory where further treatment increases purity. Checks and inspections again take place to ensure the quality, before the powder is processed into capsules. TA-65 is a natural molecule, found in the Astragalus, an ancient plant with medicinal properties. This plant can be bought in a regular grocery store. The medicinal properties, by a simple consumption of the plant, however, are miniscule to those of the purified product. Why not get the cheaper version from the vitamin shop? Studies have shown that no active TA-65 is present in these versions. The molecule is in fact destroyed in a conventional extraction process. The unique processes of T.A. Sciences are the result of years of research and investments of millions of dollars. T.A. Sciences has more than 250 patents to its name. Do the capsules contain allergens? TA-65 does not contain dairy products, eggs, gluten, corn, soy, wheat, sugar, starch, salt, preservatives, artificial colors or fragrances and flavors. The risk of toxicity and side effects are also examined in detail. Until today there are no known. What are the other ingredients? Microcrystalline cellulose, hypromellose, hypromellose acetate succinate and silica. When should TA-65 be taken? It is up to you to decide. When taken before breakfast, you’ll enjoy the day with more energy, endurance and productivity. The intake at night is linked to a regular sleep rhythm. However, the active substance is absorbed better on an empty stomach. TA-65 is a dietary supplement and not a drug. It activates telomerase and thereby optimizes the operation of cells. Does the intake lead to an increased risk of cancer? The Astragalus extract has been taken, trouble free, for more than 1000 years. In practice, this is no evidence of any cancer risk. The existing telomere shortening in cancer patients may in fact be reversed. Is TA-65 for Skin the only product for skin care? No, TA-65 does not replace other skin products. The daily skin care must be further maintained. Clinical studies prove quite a reduction of wrinkles, redness and inflammation even when TA-65 for Skin is used as the only product. TA-65 for Skin was not tested in combination with other skin care products, but is believed to be compatible. The combination is even recommended. We recommend the application of TA-65 for Skin to skin before other products. If exposed to the sun, we recommend a suitable product with sun protection factor is applied. Age spots can fade with continuous use. 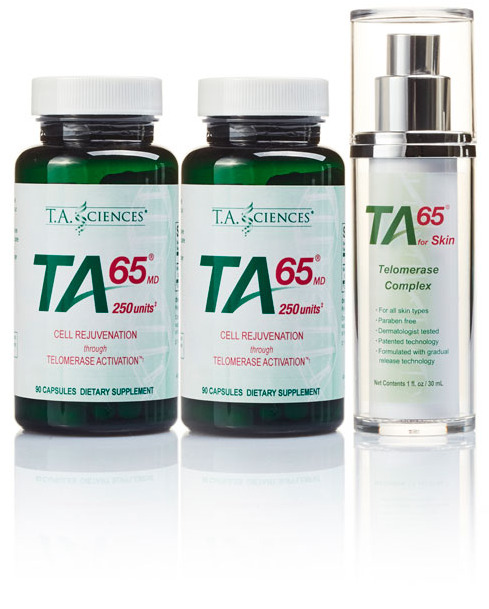 Intake of TA-65 capsules could also lead to disappearing of the symptoms of aging of the skin. How should TA-65 for skin be applied? The product has been only tested on dried skin. Light massage improves the absorption. Apply on the face not only on the wrinkles and creases, but the entire surface. Avoid direct eye contact. The dosage of the TA-65 dietary supplement capsules is different for each person. It mainly depends on your age and health history. Best take the TA-65 capsules on an empty stomach, unless you have a sensitive stomach. For adults between 40 and 50 years: 200-250 units (1 capsule TA-65, 250 IU or two capsules TA-65, 100 IU) per day. For adults between 50 and 60 years: 500 units (2 capsules TA-65, 250 IU) per day. For adults over 70: 1.000 units (4 capsules TA-65, 250 IU) per day. When and how to take TA-65 capsules? You should make sure the TA-65 capsules be taken on an empty stomach, unless you have a sensitive stomach.